Business Intelligence Developer collaborates with business analysts and customers to fulfill the business requirements. 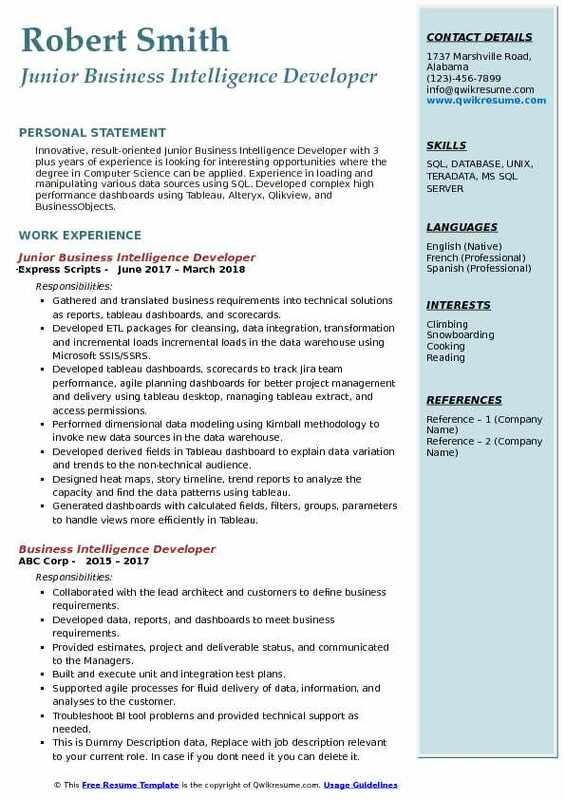 A well-crafted Business Developer Resume embraces the following responsibilities- translating business needs into technical specifications, designing, deploying and building BI solutions, maintaining and supporting data analytics platform, creating tools for data storage, conducting unit tests, evaluating and improving the current BI system, collaborating with other teams for system integration, developing and executing database queries, conducting analyses, developing and updating technical documentation. 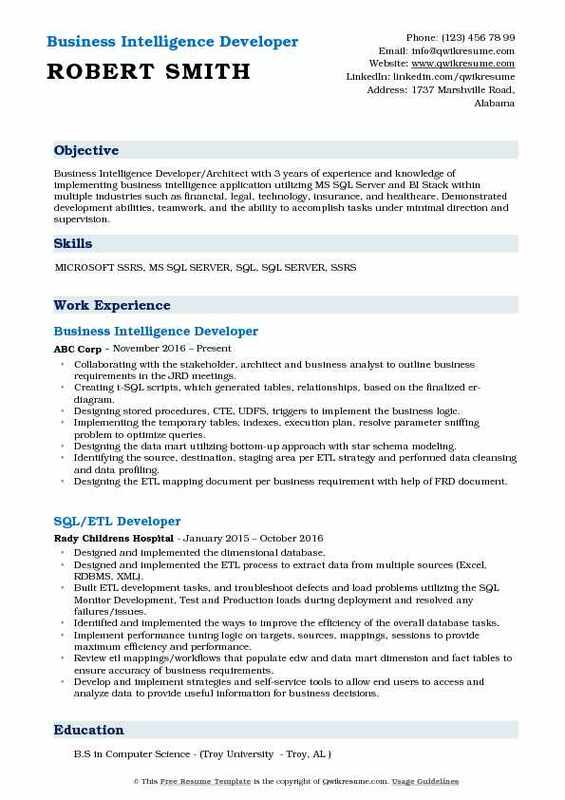 Most of the hiring employers prefer a BI developer resume that depicts a strong data warehouse designing background, in-depth understanding of database management systems, OLAP and ETL platform, familiarity in BI technologies like MS Power BI or Oracle BI. BI developers normally hold a Degree in Computer Science, IT or Business. Summary : Pursued Masters in Computer Science, having 8 years of professional IT experience. Looking forward to solving real problem by using known and learning modern technology. QlikView, DB2 server and SQL server integrated custom application is used for analyzing and predicting the seasonal trends on client products. Working with high-performance data integration solutions that connect multiple data sources for extracting and rapidly transforming the data for loading into the pre-designed data warehouses. Execution of the daily data publishing procedures from start to finish using the IWAY data migrator 7 and creating new ETL procedures for data extraction and transformation. Importing data from various sources (flat file, excel, raw file & various databases) and exporting to various destinations using SSIS (2008). Using the ETL tools (SSIS) to develop jobs for extracting, cleaning, transforming and loading data into data warehouse. Creating databases and schema objects including tables, indexes, and applied constraints. Connecting various applications to the database and writing functions, stored procedures and triggers. Extensively using the SSIS transformations such as lookup, derived column, data conversion, working on all activities related to the development, implementation, administration and support. 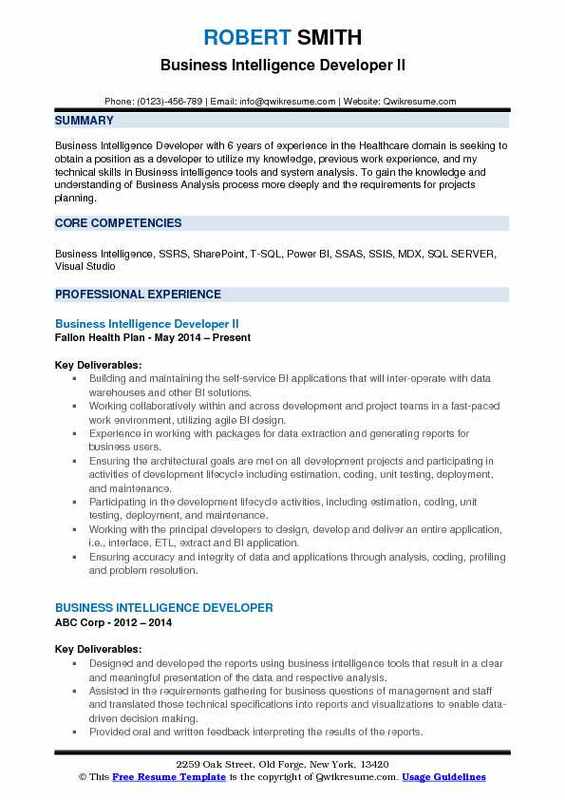 Headline : Business Intelligence Developer with 6 years of experience in the Healthcare domain is seeking to obtain a position as a developer to utilize my knowledge, previous work experience, and my technical skills in Business intelligence tools and system analysis. To gain the knowledge and understanding of Business Analysis process more deeply and the requirements for projects planning. Building and maintaining the self-service BI applications that will inter-operate with data warehouses and other BI solutions. Working collaboratively within and across development and project teams in a fast-paced work environment, utilizing agile BI design. Experience in working with packages for data extraction and generating reports for business users. Ensuring the architectural goals are met on all development projects and participating in activities of development lifecycle including estimation, coding, unit testing, deployment, and maintenance. Participating in the development lifecycle activities, including estimation, coding, unit testing, deployment, and maintenance. Working with the principal developers to design, develop and deliver an entire application, i.e., interface, ETL, extract and BI application. Ensuring accuracy and integrity of data and applications through analysis, coding, profiling and problem resolution. Working on major projects with vendors, data validation project mainly for CMS audit, broker bonus. Interacting with users and deliver the results up to their requirements. Extensively involved in resolving the daily issues in the daily doc production environment. Creating member universe for the purpose of Ad hoc reporting against the data marts. Helping users in understanding web and run reports against the universe. 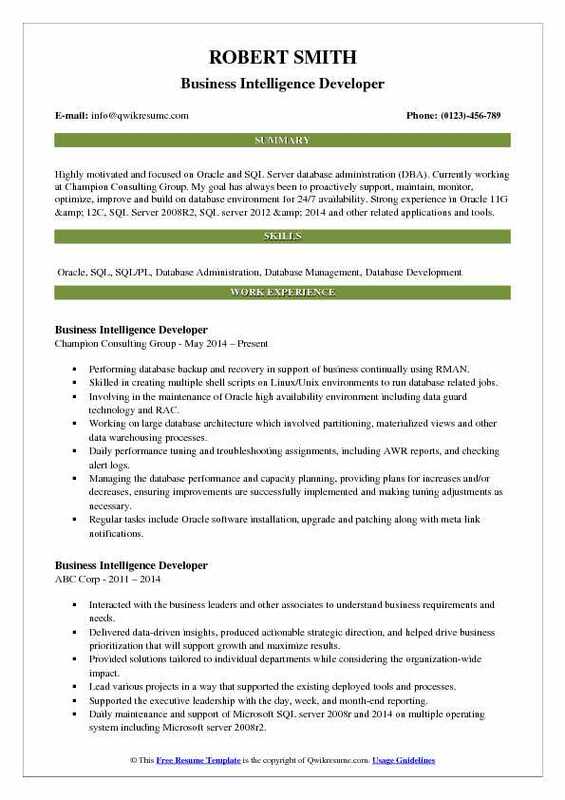 Headline : Highly motivated and focused on Oracle and SQL Server database administration (DBA). Currently working at Champion Consulting Group. My goal has always been to proactively support, maintain, monitor, optimize, improve and build on database environment for 24/7 availability. Strong experience in Oracle 11G & 12C, SQL Server 2008R2, SQL server 2012 & 2014 and other related applications and tools. Performing database backup and recovery in support of business continually using RMAN. Skilled in creating multiple shell scripts on Linux/Unix environments to run database related jobs. Involving in the maintenance of Oracle high availability environment including data guard technology and RAC. Working on large database architecture which involved partitioning, materialized views and other data warehousing processes. Daily performance tuning and troubleshooting assignments, including AWR reports, and checking alert logs. Managing the database performance and capacity planning, providing plans for increases and/or decreases, ensuring improvements are successfully implemented and making tuning adjustments as necessary. Regular tasks include Oracle software installation, upgrade and patching along with meta link notifications. Worked with the bi team to design and develop an automated ETL solution to load the data warehouse and process the cube. Designed, developed and maintained universes by defining joins, cardinalities between tables applying contexts and alias tables to remove cyclic dependencies. 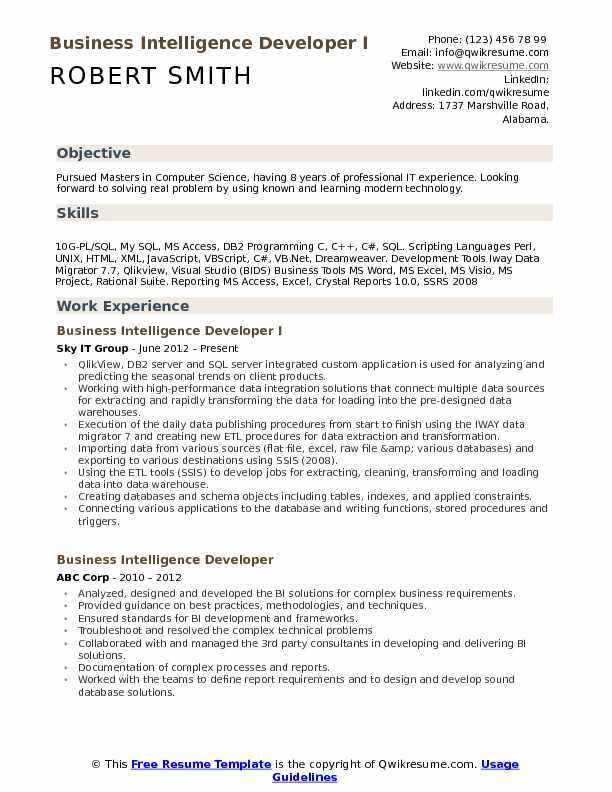 Objective : Current Business Intelligence Developer at Fidelity Investments. 3 years experience in data analysis, manipulating and analyzing different kinds of the dataset by Python and SQL, including statistical analysis and machine learning algorithm. Extensively involved in requirements gathering, writing ETL specifications and preparing design documents. Analyzing and detecting the data quality issues and recommending the corrective courses of action. Development of mappings based on given requirements and business rules to load data from desired source tables to target tables. Worked for development, enhancement & supporting Edw which is on Teradata. Worked with business analyst & data modelers in understanding the BRD - business requirement document, mapping document, and data model. Working with Toad and Oracle developer to prepare Oracle queries to validate the data in both source and target databases. Interacting with the business SMEs on requirement gathering, understanding the business and functional requirements. Collaborating with the end users to identify technical requirements for the development project based on their business requirements. Developing Informatica mappings, reusable transformations and created PL/SQL stored procedures/packages for extracting data from source systems to staging and processing and loading to the data warehouse. Involving in enhancements and maintenance activities of the enterprise data warehouse. 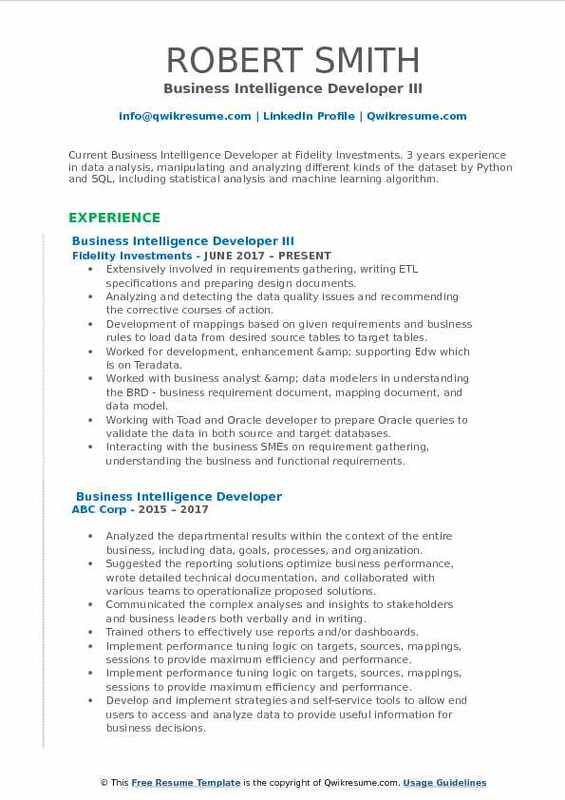 Objective : Innovative, result-oriented Junior Business Intelligence Developer with 3 plus years of experience is looking for interesting opportunities where the degree in Computer Science can be applied. Experience in loading and manipulating various data sources using SQL. Developed complex high performance dashboards using Tableau, Alteryx, Qlikview, and BusinessObjects. Gathered and translated business requirements into technical solutions as reports, tableau dashboards, and scorecards. Developed ETL packages for cleansing, data integration, transformation and incremental loads incremental loads in the data warehouse using Microsoft SSIS/SSRS. Developed tableau dashboards, scorecards to track Jira team performance, agile planning dashboards for better project management and delivery using tableau desktop, managing tableau extract, and access permissions. Performed dimensional data modeling using Kimball methodology to invoke new data sources in the data warehouse. Developed derived fields in Tableau dashboard to explain data variation and trends to the non-technical audience. Designed heat maps, story timeline, trend reports to analyze the capacity and find the data patterns using tableau. Generated dashboards with calculated fields, filters, groups, parameters to handle views more efficiently in Tableau. Responsible for maintaining SSIs ETL, Dev, QA, production data warehouse and BI reporting environments. Optimized tableau dashboards for minimal load time, eliminate performance bottlenecks using best practices. Developed complex statistical and forecasting reports using several R functions in Tableau workbooks. Worked with the technical and functional teams to identify and correct data anomalies using data quality reports. 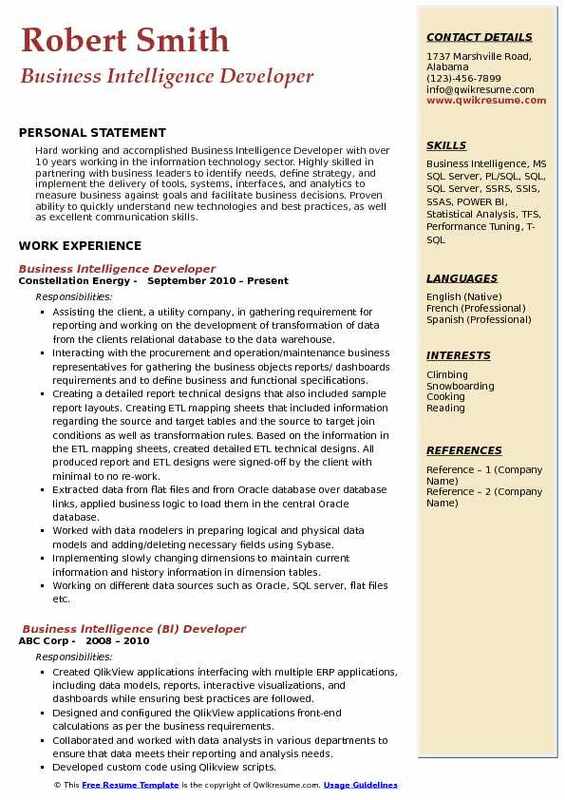 Objective : Business Intelligence Developer/Architect with 3 years of experience and knowledge of implementing business intelligence application utilizing MS SQL Server and BI Stack within multiple industries such as financial, legal, technology, insurance, and healthcare. Demonstrated development abilities, teamwork, and the ability to accomplish tasks under minimal direction and supervision. Collaborating with the stakeholder, architect and business analyst to outline business requirements in the JRD meetings. Creating t-SQL scripts, which generated tables, relationships, based on the finalized er-diagram. Designing stored procedures, CTE, UDFS, triggers to implement the business logic. Implementing the temporary tables, indexes, execution plan, resolve parameter sniffing problem to optimize queries. Designing the data mart utilizing bottom-up approach with star schema modeling. Identifying the source, destination, staging area per ETL strategy and performed data cleansing and data profiling. Designing the ETL mapping document per business requirement with help of FRD document. Identifying and maintaining the SCD and role-playing dimension during the designing of the data mart. Created SSIS packages for data loading utilizing various task and transformations within the SSIS. Performed troubleshooting of SSIS packages utilizing error logs, checkpoints, breakpoints, and data viewers. Summary : Dynamic and motivated Business Intelligence Professional with a proven record 11 years of generating and building Database, Data Warehouse, ETL packages, Reports/Dashboard applications. Adaptable and transformational leader with an ability to work independently, managing projects from concept to completion, utilizing scrum/agile methodologies in banking/financial, healthcare, and insurance industries. Worked closely with teams to gather, analyze, and document business cases, functional and technical requirements, and processed the flow diagrams for new projects, enhancements to existing solutions and production issues reported by the end users. Participated in the end to end implementation planning including project management, issue management, communication and change management. Interpreted the business needs and technical requirements into an integrated solution, providing direction for system enhancements and defect fixes. Managed UAT with end users including coordination and user acceptance signoff. Managed the relationships with multiple teams for new solution features and technical support. Created, delivered, and presented the end-user training materials to users throughout the organization. Developed complex reports and dashboards and supported the existing reports using SQL Server Reporting Services (SSRS) and Power BI based on the end-user requirements. 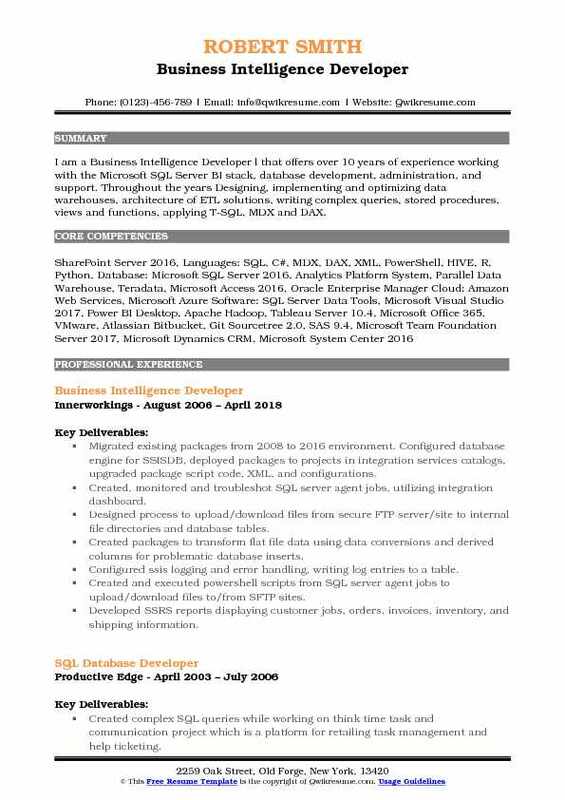 Summary : I am a Business Intelligence Developer l that offers over 10 years of experience working with the Microsoft SQL Server BI stack, database development, administration, and support. Throughout the years Designing, implementing and optimizing data warehouses, architecture of ETL solutions, writing complex queries, stored procedures, views and functions, applying T-SQL, MDX and DAX. Migrated existing packages from 2008 to 2016 environment. Configured database engine for SSISDB, deployed packages to projects in integration services catalogs, upgraded package script code, XML, and configurations. Created, monitored and troubleshot SQL server agent jobs, utilizing integration dashboard. Designed process to upload/download files from secure FTP server/site to internal file directories and database tables. Created packages to transform flat file data using data conversions and derived columns for problematic database inserts. Configured ssis logging and error handling, writing log entries to a table. Created and executed powershell scripts from SQL server agent jobs to upload/download files to/from SFTP sites. Developed SSRS reports displaying customer jobs, orders, invoices, inventory, and shipping information. Used stored procedures to populate datasets, created report parameters, defined row and column groups. Created tabular, matrix and dashboard reports, embedding charts, graphs and KPIs. Developed reports in visual studio and report builder, deployed reports to report server. Created and modified olap cubes using data warehouse fact and dimension tables. Created data source views, dimensions, measures and defined measure group relationships. 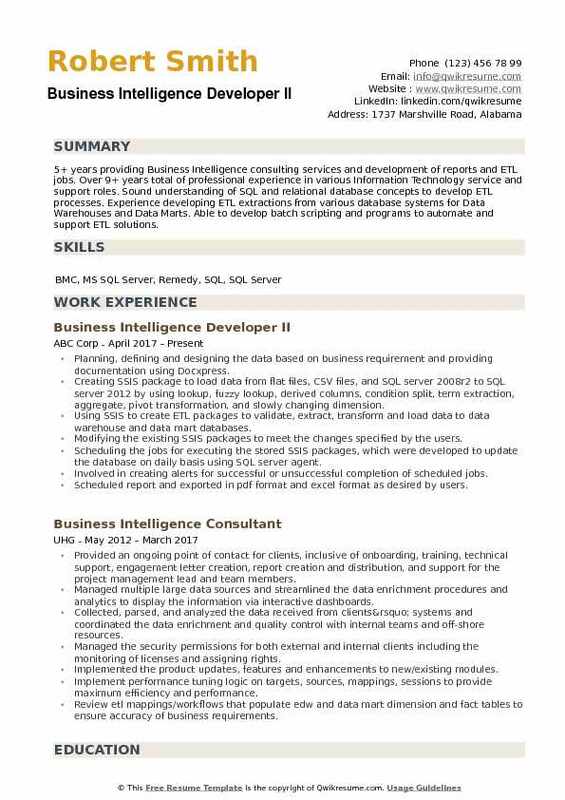 Summary : Hard working and accomplished Business Intelligence Developer with over 10 years working in the information technology sector. Highly skilled in partnering with business leaders to identify needs, define strategy, and implement the delivery of tools, systems, interfaces, and analytics to measure business against goals and facilitate business decisions. Proven ability to quickly understand new technologies and best practices, as well as excellent communication skills. Assisting the client, a utility company, in gathering requirement for reporting and working on the development of transformation of data from the client's relational database to the data warehouse. Interacting with the procurement and operation/maintenance business representatives for gathering the business objects reports/ dashboards requirements and to define business and functional specifications. Creating a detailed report technical designs that also included sample report layouts. Creating ETL mapping sheets that included information regarding the source and target tables and the source to target join conditions as well as transformation rules. Based on the information in the ETL mapping sheets, created detailed ETL technical designs. All produced report and ETL designs were signed-off by the client with minimal to no re-work. Extracted data from flat files and from Oracle database over database links, applied business logic to load them in the central Oracle database. Worked with data modelers in preparing logical and physical data models and adding/deleting necessary fields using Sybase. Implementing slowly changing dimensions to maintain current information and history information in dimension tables. Working on different data sources such as Oracle, SQL server, flat files etc. Created complex mappings in OWB designer using aggregate, expression, filter, and sequence generator, update strategy, union, lookup, joiner and stored procedure transformations. Created process flows in UC4 to schedule OWB jobs and also created dependencies between the jobs. 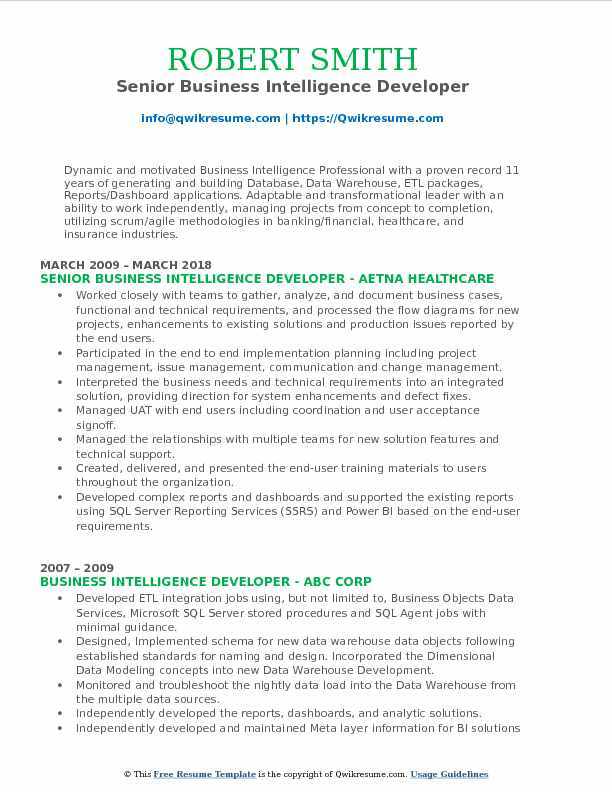 Headline : 5+ years providing Business Intelligence consulting services and development of reports and ETL jobs. Over 9+ years total of professional experience in various Information Technology service and support roles. Sound understanding of SQL and relational database concepts to develop ETL processes. Experience developing ETL extractions from various database systems for Data Warehouses and Data Marts. Able to develop batch scripting and programs to automate and support ETL solutions. Planning, defining and designing the data based on business requirement and providing documentation using Docxpress. Creating SSIS package to load data from flat files, CSV files, and SQL server 2008r2 to SQL server 2012 by using lookup, fuzzy lookup, derived columns, condition split, term extraction, aggregate, pivot transformation, and slowly changing dimension. Using SSIS to create ETL packages to validate, extract, transform and load data to data warehouse and data mart databases. Modifying the existing SSIS packages to meet the changes specified by the users. Scheduling the jobs for executing the stored SSIS packages, which were developed to update the database on daily basis using SQL server agent. Involved in creating alerts for successful or unsuccessful completion of scheduled jobs. Scheduled report and exported in pdf format and excel format as desired by users. Fine-tuned SQL queries for maximum efficiency and performance using SQL profiler and database engine tuning advisor. Building the dashboards and performing the Ad hoc analyses with SSRS, Tableau and Power BI. Designing and implementing the stored procedures and triggers for automating tasks. Working in setup logging environment to track the status of the events like error raise, task fail.